This most coveted award took the room by surprise as The Cardinall’s Musick beat off competition from the world’s most celebrated conductors, soloists and opera companies to scoop the top title. This is only the second time in the 34-year history of the Gramophone Awards that an Early Music release has taken the most prestigious prize of the day. 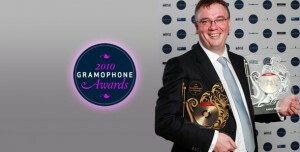 This was the fourth time the group had won the Early Music Award at the ceremony, an award selected annually by critics for The Gramophone Magazine and various members of the industry, including retailers, broadcasters, arts administrators, and musicians. The Recording of the Year, however, was selected by a panel of critics from a shortlist of the sixteen category winners, which meant the Cardinall’s Musick beat the Royal Opera House, Glyndebourne Opera, and the HallÉ to the top prize! It seems clear that the Recording of the Year award is keen to acknowledge the achievement of the entire series not just this final volume. Gramophone have been fulsome in their praise – ‘one of the most important recording projects of the last couple of decades … just as exciting as when Harnoncourt and Leonhardt finished their Bach Cantatas’. ‘A musical experience of vivid imagination, awe-inspiring concentration and, finally, resolution in a series that has become a glory of the early music catalogue’. The award points to twenty years of music making by a loyal group of singing friends who by this thirteenth volume were able to approach the music with a ‘sense of soaked commitment and lived-in purpose’. It also marks the musicality, inspiration and imagination of Andrew Carwood, as well as the fine production standards of Martin Haskell, Jonathan Freeman-Attwood and Hyperion Records. Finally, it recognises William Byrd as ‘one of the greatest composers of all time, not just of England but of anywhere else’. The award and these recordings provide a fitting tribute to this most intellectually and emotionally satisfying composer.